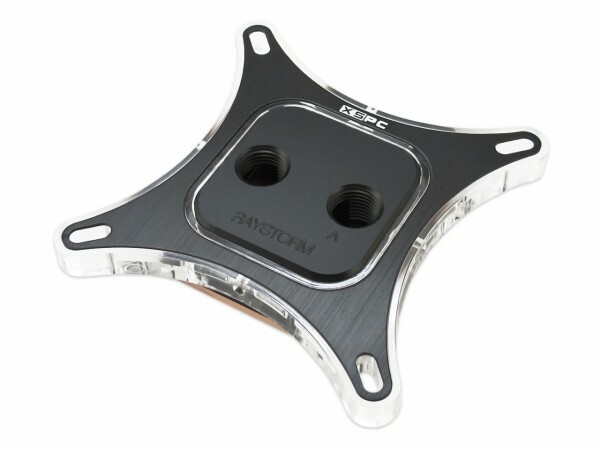 According to XSPC this water block is the best-performing water block they ever created, coming in a beautiful design. Designed for multi-core CPUs! Made from a combination of Plexi and Acetal, this water block is truly stunning to look at! The included 3mm white double LEDs, up to 4 can be installed, allow this water block to create unique lighting effects. Cooling performance is everything on the processor, the heart of the system. Only with good cooling the full overclocking potential of your system can be utilized! Tests show that this water block from XSPC is truly well-engineered and features great cooling performance. A copper cooling plate with a fine fin structure for increased cooling surface and performance ensure an outstanding cooling performance. A low remaining thickness of the cooling plate ensures a low thermal resistance, hence increased thermal transfer. With this water block it is almost like the CPU itself is cooled directly! A jet plate optimizes the flow pattern inside of the block and helps with the dissipation of heat. A well-designed system and great performance make this one of the best water blocks on the market! Attention! On this product, is given warranty by the manufacturer XSPC only one year. These pictures are only sample images.